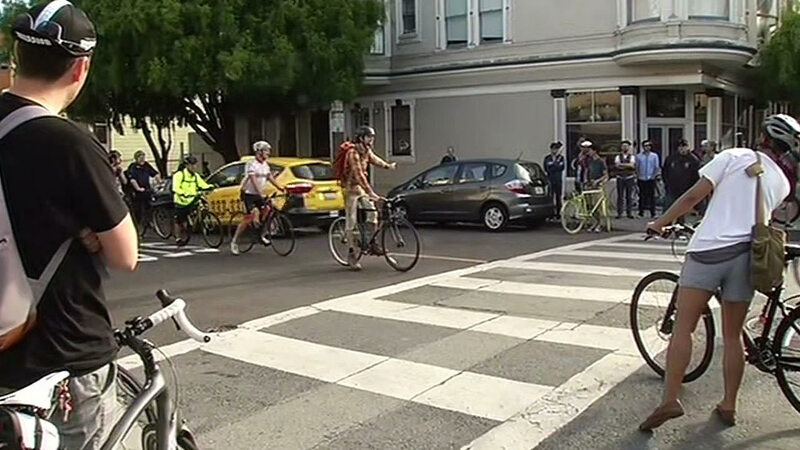 Wednesday evening bicyclists riding through the Lower Haight wanted to prove how silly it seems to stop at every stop sign like a car has to. SAN FRANCISCO (KGO) -- Some San Francisco bicyclists who say outdated traffic laws are bad for them -- and for drivers -- proved their point Wednesday evening by following the rules of the road just like everyone else. It happened along a popular cross-city bike route which cuts through the Lower Haight District. San Francisco is known for its street-theatre protests, so there was quite a show along the bike lanes in the city. Cyclists did exactly what's right, to prove it's wrong. They obeyed the law to protest the law by stopping at each and every stop sign, hoping to back up traffic. It is a challenge to one police captain's recent crackdown on bicyclists who roll through, especially on this popular bike corridor in the Lower Haight known as "The Wiggle". "You can maneuver more easily and so it's very easy for cyclists to treat it as a yield sign and be perfectly safe," Morgan Fitzgibbons from the "The Wigg Party" group said. San Francisco Mayor Ed Lee, however, is not so sure. He told ABC7 News, "I'm willing to have conversations about the highest level of safety, but I can't accept just one entity's point of view about what that safety is, if it's all self-centered." Drivers and even neighbors were upset at cyclists protesting bicycle laws and enforcement in San Francisco. Activists believe focusing on bicyclists takes attention and resources away from the most deadly traffic violations, but San Francisco Police Chief Greg Suhr. "I would suggest that we are not over enforcing on bicyclists, if only 1 percent of the tickets are going to bicyclists," Suhr said. Regardless, Board of Supervisors president London Breed calls the citations over the top. She told ABC7 News, "It's one thing to break the law, to blatantly break the law. It's another thing to do a yield through a stop sign, and roll through a stop sign, when there's no one else is around." And she plans to look into crafting legislation like the so-called "Idaho stop" which allows cyclists to treat a stop sign as a yield sign. That's a law the San Francisco activists on two wheels are pushing for.